Yes! Breakfast is from 8am to 10am everyday in the lobby. We have baked goods, cheese and salami, oatmeal, grits, jelly, and some other goodies. And coffee. Lots of coffee. At The Quisby you’ll find a 24 hour front desk and bar, daily housekeeping, and free breakfast every morning. What makes us different is all of our rooms have bunk beds. You can book a room privately (and have four beds to yourselves) or book an individual bed in a shared room with other travelers. These people are strangers now, but soon they’ll be your friends. What’s the best way to get to The Quisby? Is there a minimum/ maximum age? Our minimum is 18 but there is no maximum. What time is check-in/check out? Can we check-in early? If not, can we store our luggage? Check in is at 4pm. If you get here sooner, stop by the front desk, sometimes we’re able to check you in early. If not, we can definitely store your bags until your room is ready. Unfortunately we don’t offer any parking onsite. There is a paid lot, Premium Parking – Lot P148, 3 blocks away at 900 Saint Charles Ave. There is also usually some free street parking to be had in the area, just be mindful of signage and make sure not to block any driveways. Do you guys provide towels/ linens? Yes! We provide fresh towels and linens for everyone checking in, and the beds are already made by our wonderful housekeeping team. Me and my friend want to share a bed, can we book one bed in a shared room? No, if staying in a shared room, you must book a bed for each member of your group. I’m checking out very early in the morning, will there be someone at the desk?I’m arriving very late, can I still check in? No worries, we have someone on staff 24/7 to accommodate accordingly. The bar is 24/7 too, feel free to grab a drink on your way in or out! Are there places in the neighborhood to eat, drink, etc.? Yes there are plenty of places in the neighborhood to eat and drink. 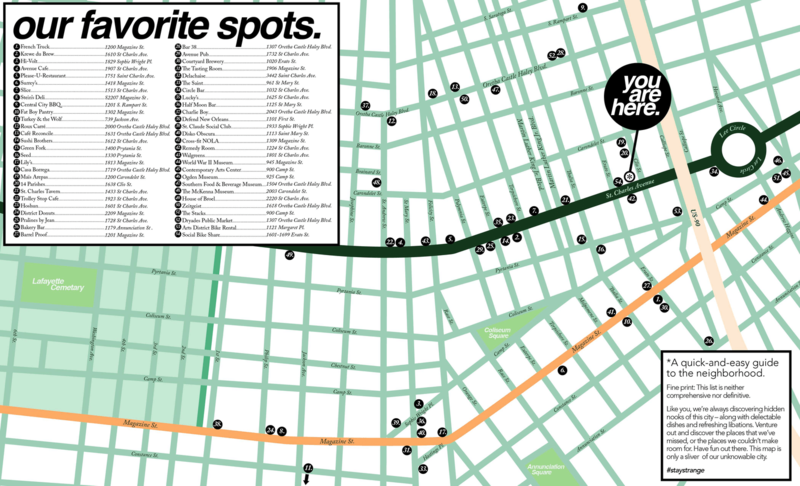 Check out our neighborhood guide to see some of our favorite places. Do you guys have offer a work-stay program? We don’t have a work stay program at the moment but feel free to drop by and say hello when you’re in town. Can I get some things mailed to the hostel? Yes! The item should be addressed to the name on your reservation. Our storage is limited so please keep it to a few items and nothing oversized. Do you book tours for guests? Yes! Come chat with the front desk when you’re here or give us a call. We’re here to help. Can my friends and I stay in the same room? We can’t guarantee it, but we are usually able to keep friends together. If you are under separate reservations, please let us know and we’ll do our best to make it happen. Sadly, we do not allow pets. Sorry Fido. Do you have female only dorms? Didn't answer your question? Contact us today!